Famed as the first luxury train of south India, the Pride of South Train is an elaborative way to explore the many worlds of Karnataka in utmost luxury. 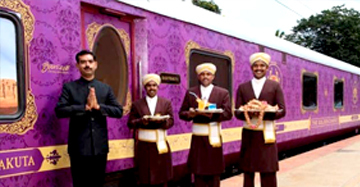 This magenta hued luxury train with gilded with gold and a royal emblem ferries passengers not only to the interesting destinations around Karnataka and in Goa in royal indulgence. 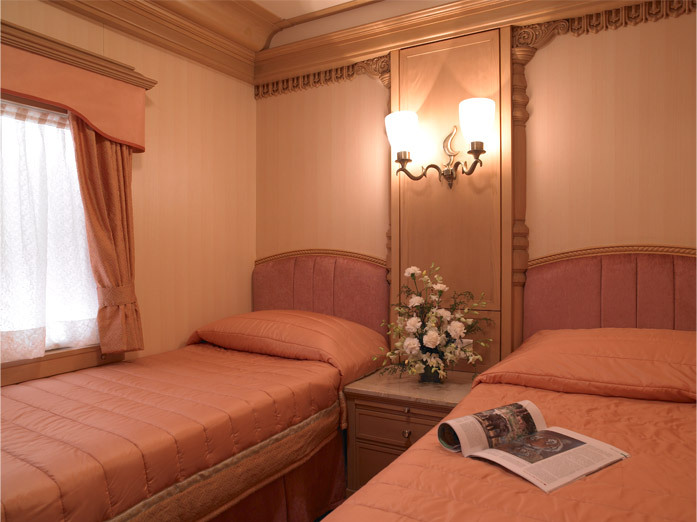 The 18 coach train is designed for connoisseurs of indulgence. From the coaches named on the ruling dynasties of Karnataka to the royally inspired interiors of the artistic Kannada, everything is draped in luxury and indulgence. The Madira Bar where the passengers can enjoy the tasteful selection of wines, liquors and spirits poured by the royal attendants in their handcrafted crystal ware. The kings of Golden Chariot have royal chefs who take care of their taste buds at Ruchi and Nalapaka, two royally furnished restaurants at the Pride of South Train. But that's not all; the royal entourage is complete only with the seven day journey through the seven kingdoms of Karnataka. Some of them are marveled for its planned structures, whereas others are etched in stone. The profusely crafted monuments, temples and elaborate structure gave Karnataka the status of the 'Cradle of Stone Architecture. The Pride of South Train takes you through such architectural and artistic marvels surrounded by all the luxuries befitted for kings. The entourage on train features a visit to Mysore, Sravanabelagola, Belur, Halebeedu, Badami, etc. 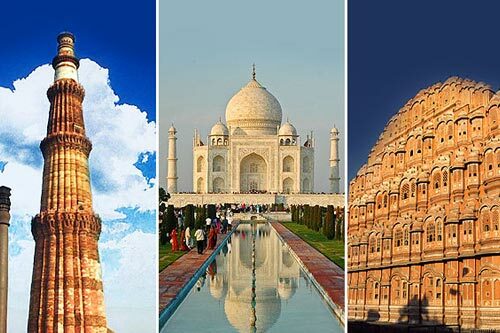 The tour also features a visit to the World Heritage Sites of Hampi and Pattadakal. Towards the end, the Pride of South Train sums up its glorious journey in Goa. This seven day journey over seven kingdoms is surely an eloquent reminder of rich heritage that only Karnataka bestows on the royal travellers. 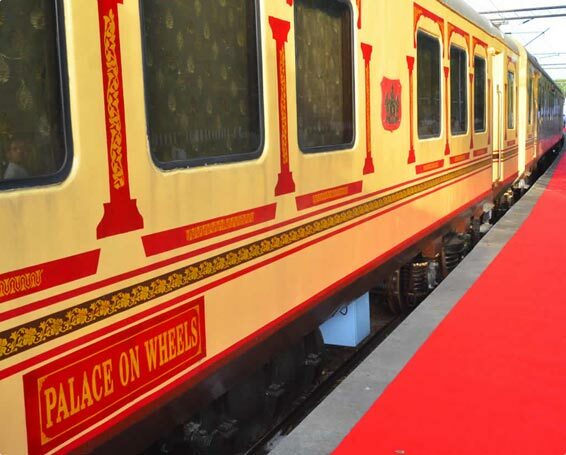 Artistic Tour - There are three different ways to embark on your Golden Chariot – Pride of South Train Tour. First option is suited for the art lovers, where on arrival in Bangalore, you would be transferred to the Taj West End, for a High Tea event at the Banquet Hall. Post this event; a presentation would be showcased where you get to know about The Golden Chariot’s Route to The Pride of South. 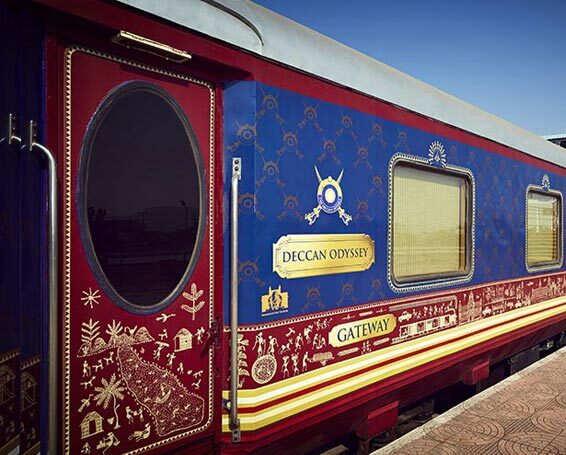 This would feature a briefing where you get to know Do’s-Don’ts, safety and security onboard the luxury train. After this, the passengers would be transferred to Chitrakala Parishad / Art Gallery where they get to marvel at the paintings put on display. This artistic experience would be led by a one hour cultural show based on Karnataka. After this enriching experience, you would be taken to the Yeshwantpur Railway Station where the Pride of South would be waiting for you to step in it and discover a sumptuous world in its own. You would be traditionally welcomed in the authentic Indian style on the arrival. Dinner would be served onboard The Golden Chariot. Around 21:00, the train would depart to magical Mysore. Eco Resort Tour Option - The second option to begin your Pride of South Golden Chariot Train Tour is by giving it an eco friendly beginning. For this option, you have to reach Bangalore in the early morning of Day 1. The eco resort experience would take place in ‘Our Native Village.’ At 11:00, you would be transferred ‘Our Native Village’ where we offer you a chance to experience nature at its best. This is a 100% eco resort, located in the northern Bangalore surrounded with a wide green expanse. At 12:00, you would be served the lunch at the resort. 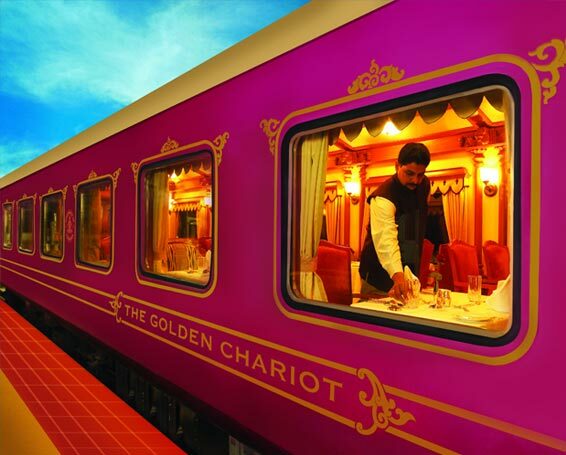 Post lunch, around 14:30 you would be briefed about The Golden Chariot – Pride of South Train Tour. At 15:00, you would be taken to a stroll through the eco-resort. Around 15:30, be ready for an Art and Culture Tour and observe The Revivalist Movement. Next excursion scheduled towards the Organic farm and herb garden tour. Followed by this, there would be a pottery session, Indian village games and bullock cart rides for you to experience the soothing and gentle eco tour option. After this excursion, you would be transferred to Yeshwantpur Railway Station, where you get to see your royal carriage laced in magenta golden hues and adorned by floral rows. 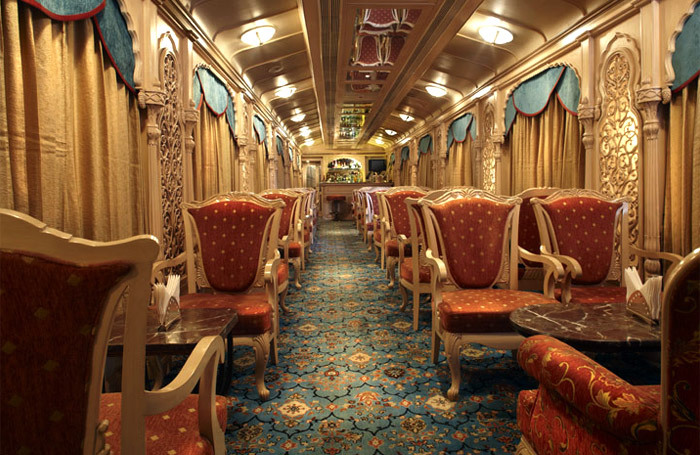 The traditional welcome of the Pride of South Train follows you inside the plush luxury train of South India. Golf Itinerary - The third option of this Golden Chariot Train passes through the lush curated golf greens of Bangalore. 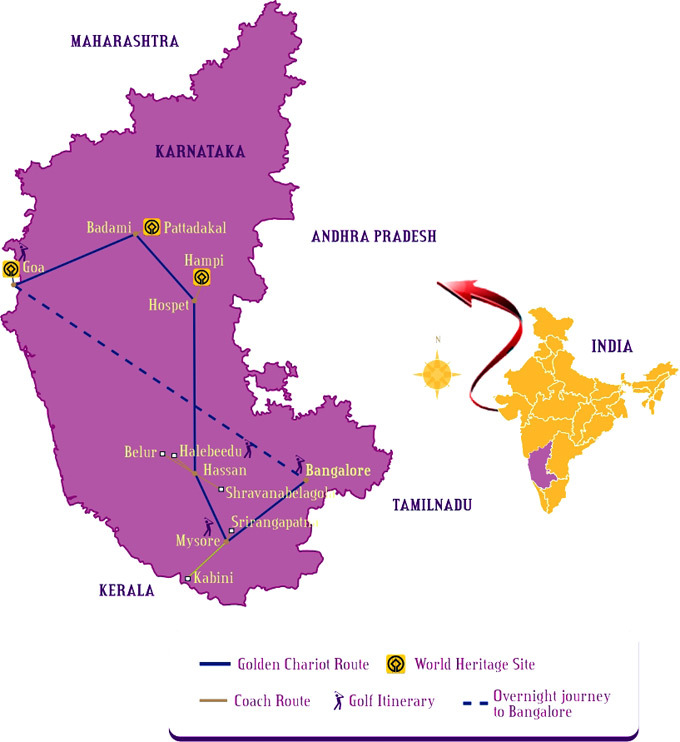 If you opt for Golf Itinerary* you need to reach Bangalore before 13:00 on the day of departure. On your arrival to Bangalore, you would be transferred to Karnataka Golf Association where you get hours and hours of playing golf on this world class lawn. At 18:00, you would be served with Snacks / Tea at the Golf course. Post Tea session, you would be departed to Yeshwantpur Railway Station where your Golden Chariot is waiting for you to enter in it and travel like royalty. The traditional royal welcome after reaching platform no. 6 at the railway station would make you feel like a king. Dinner would be served to you after boarding the Golden Chariot. At 21:00, your Golden Chariot Train would depart for the magical Mysore. After a journey of two hours in your respective royal coach, you would reach the sweetly reminiscent city of Mysore. 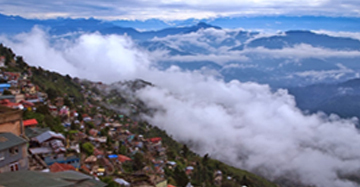 You can choose any one of the above mentioned options to begin your Pride of South Train Tour. Day two of the Pride of South would bring you closer to nature. After breakfast in the train, visit Mysore Palace at 1o:00 via AC coach. At 11:00, depart to Kabini for Nagarhole National Park. Located on the banks of River Kabini, this dense forest is spread over 55 acres where you can observe herds of elephants as a part of jungle journey. After arrival at 13:00 in Kabini, have lunch at the Jungle Lodges and Resorts. This would be followed by a jungle safari or boat safari in River Kabini. At 17:40, you would be a part of a wildlife film screening. The day would be summed up with the dinner and overnight stay at Jungle Lodges & Resorts. Highlights of Day 2 - Experience the wilderness through a jungle safari / boat ride at Kabini. Regular City Sightseeing - Day 3 would again bring to you a golden chance to experience the Pride of South Train with a difference. There are two options to make this day a fulfilling experience. First is a city visit option where you get to experience Mysore in full splendour. Embark on a boat safari at 06:30 in the early morning. This would be followed by a further journey to Mysore at 21:30 post breakfast in the AC coach. This morning excursion would bring you back on your Golden Chariot. Post Lunch, you would be transported to Srirangapatnam, the island fortress of Tipu Sultan and the capital of the Wodeyar Dynasty. The city tour includes a visit to Tipu’s mosque with its twin minarets, Ranganatha Swamy Temple, the Wellesley Bridge and the prisons where British officers were once imprisoned. In evening, arrive Lalitha Mahal Palace Hotel where you would get to view the ‘special cultural show.’ Post your dinner at the hotel; board your Golden Chariot Train at 22:00. Golf Itinerary - The second option of Day 3 also gives you a chance to play golf in the royal kingdom of Mysore. In morning, leave Kabini via boat ride and disembark at Mysore after lunch. At 14:00, you would be transferred to Hotel Lalitha Mahal Palace for a round of Golf. This would be followed by a Cultural Show at 19:00. You would enjoy the dinner with at Lalitha Mahal Palace. 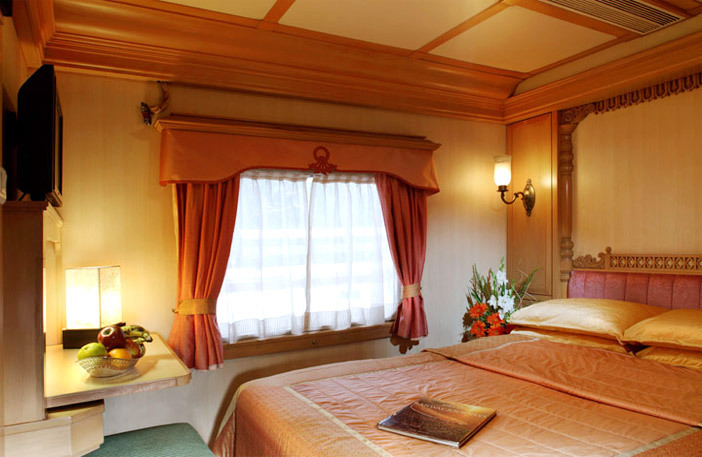 Unwind your day by returning back to your luxurious kingdoms at The Golden Chariot. 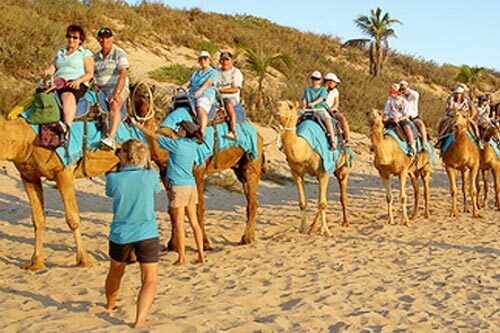 You can choose only one option from the above mentioned excursions. Highlights of Day 3 - Explore the sweet reminiscent kingdom of Mysore or Play the golf on the royal golf grounds, choice is yours. Day 4 also brings with it a wholesome experience and options to choose from. First excursion is based on heritage, whereas second option revolves around golfing. Heritage Tour Option – The heritage tour option explores the legacy of Sravanabelagola, Belur and Halebeedu, which are the examples of flourishing dynasties of Karnataka. Leave for Hassan, the base city for discovering the heritage in the early morning 06:00. Reach this Hoysala territory at 08:15 and embark on your fulfilling journey to Sravanabelagola, a prominent Jain shrine at 9:00. This largest monolithic Asian statue is a dedication to Lord Gomateshwara/ Bahubali. Lord Gomateswara here towers 18m high, looming atop the picturesque Vindhyagiri Hill. To reach this towering architectural marvel, you would have to walk through 700 steps. Only those who can undertake this are advised to do so. Guests unwilling to climb can stay back on board The Golden Chariot. 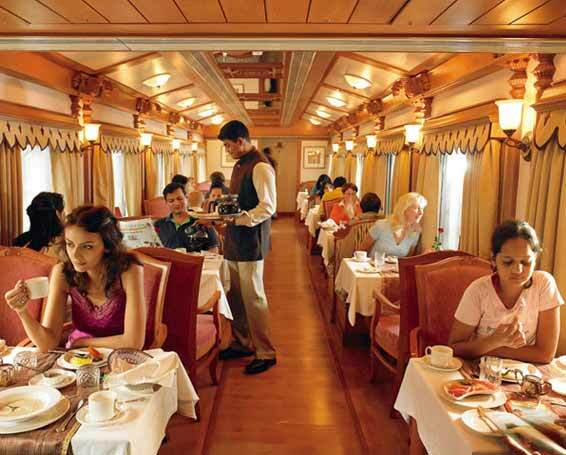 At 13:00, enjoy your lunch at The Golden Chariot Train. Post lunch around 14:45; depart to Belur and Halebeedu, a prominent Hoysala kingdom. Belur was the capital of the Hoysalas and is famous worldwide for its magnificent temple complex. The major attraction here is the Chennakesava Temple built by Hoysala King Vishnuvardhana, to commemorate his victory over the Cholas. This star shaped temple is the only living Hoysala temple actively worshipped by followers. Just 17 km from Belur is Halebeedu, the ancient capital of the Hoysalas famous for The Hoysaleshwara Temple. The temple is richly sculpted with Hindu deities, sages, stylized animals, birds and friezes depicting the life during the rule of Hoysalas. The temple timings are 10:00 to 17:00 and would be closed on Fridays. Golf Itinerary – The pursuant of Golf depart for Chikmangalur Golf Course at 9:30. Around 11:30, you would get a chance to tee around the golf course. 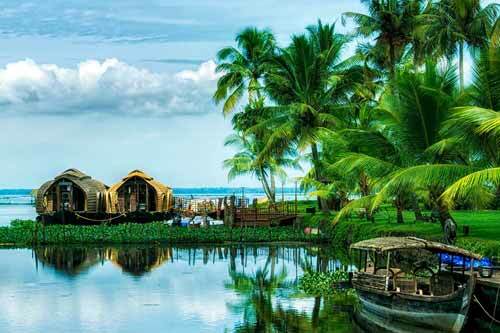 This excursion would be furthered by a sumptuous lunch at Taj Garden Retreat, Chikmangalur. At 16:00, depart for Hassan and board your Golden Chariot at 18:00. You would be departed towards Hospet at 19:45. Dinner onboard The Golden Chariot. 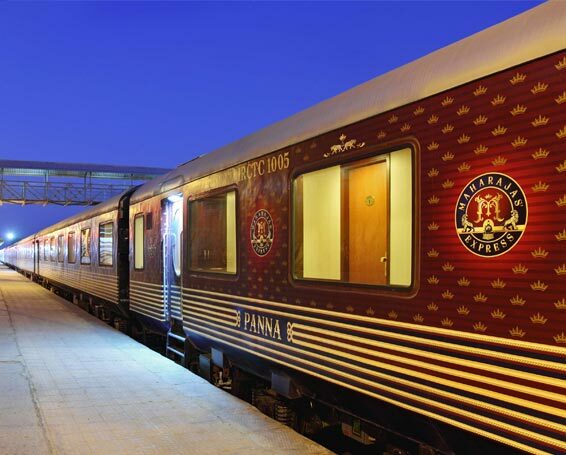 One of the two schedules for the day can be availed onboard the luxury train. Highlights of Day 4 - Explore the heritage of Karnataka through Saravanabelagola, Belur and Halebeedu or play the golf at Chikamangalur Golf Grounds. Day 5 would be another great heritage experience of the Pride of South. Early morning at 06:00, you would be arriving at Hospet, the gateway to the world heritage site of Hampi. Post breakfast at 08:30; depart for Hampi, from where you will get to see masterpieces sculpted in stone. An erstwhile Vijayanagara Kingdom, this wholesome day would lead you to the Virupaksha Temple, Queens's bath, Elephant stables, local crafts bazaar, Royal enclosure, Hazara Rama Temple which gloriously adorn the land of Hampi. Return back at 13:00 for lunch. Post Lunch, at 16:30, depart again to Hampi to see Vittala Temple and marvel at the inspiration of The Golden Chariot - The Stone Chariot. Around 20:00, step back in the Golden Chariot and sum up an enriching day. Highlights of Day 5 - Explore the world heritage site of Hampi and marvel at the inspiration of The Golden Chariot, The Stone Chariot. On Day 6, begin another enriching day at 05:00 with the departure for Badami. Reach Badami post breakfast at 08:30. The capital of Chalukyan kingdom, Badami is famous for its caves. Pattadakal, located just 22 km from Badami is a world heritage site well known for its historic temples. Post this excursion, you would be boarding the train at 13:30 and at 14:00, you would be departing for an exciting end at Goa. Evening board the train from Aurangabad railway station. Dinner onboard. Highlights of Day 6 - Enrich your experiences in Karnataka with the sightseeing of Badami and Pattadakal. The breezy gusto of Goa again brings with it two important options to plan the day. Heritage Tour Option – The Heritage Tour option begins with the world heritage sites of Goa, The churches and convents of Old Goa at 11:00. Around 12:15 pm, you would be enjoying Tea/Coffee at Solar Souto Maior. You would be also getting time to shop at the emporium. At 14:00, you would be transferred to reach Majorda Beach Resort for lunch. At 15:00, you would be getting a chance to avail the facilities of spa treatments, casino, swimming pool, beach etc. Golf Itinerary – This would be indeed a luxury to play golf on the laidback grounds of Goa. At 09:30, you would be departing to Intercontinental The Lalit Goa Resort - Golf Course. At 11:30, you get a chance to Tee off on the golfing journey. Post Golf session, you would enjoy your lunch at the hotel. In evening at 16:00 , you would depart for The Golden Chariot and board back at 15:30. 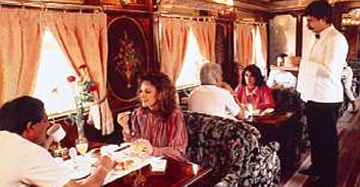 Enjoy your farewell dinner at The Golden Chariot Train. Departure to Bangalore. Highlights of Day 7 - Enjoy the beachy breeze of Goa with its Heritage tour or Golf Tour. Both sides greenery. Sum up your Pride of South – The Golden Chariot Train Tour with the memories of pride and honour. * Travellers can choose any one option. Pricing: An additional charge of USD 125 per person per round of Golf is applicable. Conditions: Golf can be included only when a minimum of four guests choose the option. Golf itinerary is subject to change without prior notice. Itinerary, destination and scheduled departure may change without prior notice. The Pride of South Train is an exclusive presentation from The Golden Chariot Train, where you get to experience the richness bestowed on the Karnataka and Goa. The mighty chariot of South India runs only for a few months, when the weather and the surroundings offer an unbeatable match. 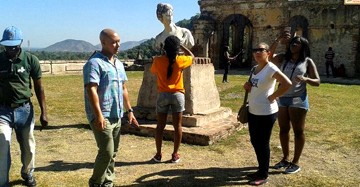 Here, we are furnishing the scheduled dates when you can enjoy the tour in a great fervor. 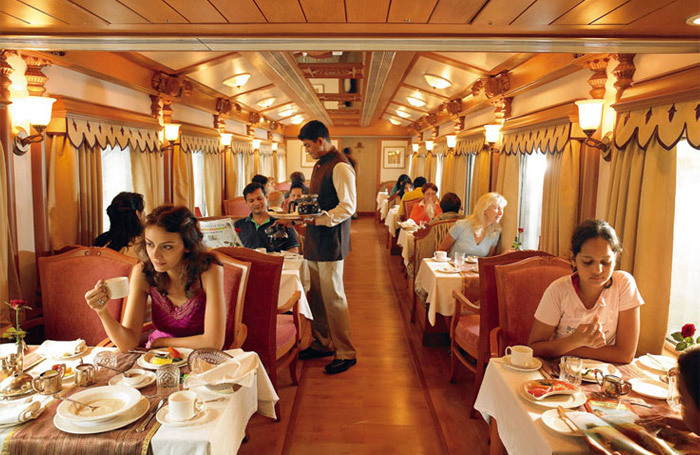 During this scheduled period, the Pride of South Train becomes a great tour experience wherein you get pampered with the immaculate hospitality, served with a bountiful serving of heritage, history and luxurious indulgence. Please go through the schedule and block your date for your royal tour. You can even make your Christmas and New Year Celebrations memorable by opting for special tour for festive season. The Pride of South rolls smoothly from Bangalore, a scenic and cosmopolitan city of south and enters the mesmerizing Mysore, the royal seat of Wodeyars. From there, the journey takes a U turn to nature at Kabini’s Nagarhole National Park. This natural safari is furthered into an overwhelming heritage experience at Hassan’s Sravanabelagola, featuring 80 ft largest monolithic statue of Lord Gomateshwara and Hoysala territories of Belur and Halebeedu. The heritage experience furthers at Hampi, where you can marvel at the inspiration of The Golden Chariot, stone chariot at Vittala Temple. The next heritage destination is in Badami, the kingdom of Chalukyas and Pattadakal temples, a world heritage site. Towards the end, you get a chance to walk on the breezy beaches of Goa, and relax in this jovial state.